Horse racing is one of the favourite pastimes of many Australians. Big horse races in Australia include, the Victoria Derby, the Golden Slipper Stakes, the Crown Oaks, the Cox Plate and of course the Melbourne Cup. William Hill rebranded SportingBet as William Hill Australia after the UK betting giant bought the Australian bookmaker in 2015. 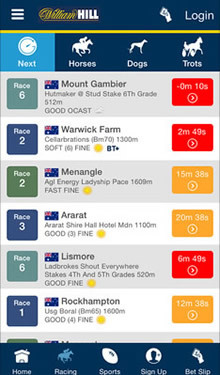 The app was completely revamped and how live streams racing from NSW & Victorian racetracks. As you might expect, the app focuses mainly on horse racing from racetracks in Australia although you can also bet internationally on racing the United Kingdom, Ireland and the United States. Odds are available on thoroughbred, trots (harness) and even greyhound racing. From the racecard you can choose your tote and a wide range of betting types are offered, including Win/Place, Quinella, Trifecta, Exacta and Mystery. The form guide uses graphics and charts to let you see at the glance how each horse has performed in its previous outings. The William Hill Australia app can be download via the browser of iOS, Windows Phone or Android device. The mobile industry within sports betting is one that is growing, and at an alarming rate. There are bookmakers that claim that over 50% of their traffic now comes via that of mobile devices so it comes as little surprise to hear that a lot of betting products are switching to mobile technology. Australian horse racing is a very established market with some of the biggest meetings in the world (Melbourne Cup) being held in the country. That being said, they are actually one of the few markets that have managed to incorporate a strong hold on the mobile industry with a flurry of different apps all designed to aid that of the Australian punter. The most common form of horse racing apps for Australia punters comes in the form of the racing news and form. This is mainly because bookmakers tend to incorporate a rather detailed section that includes this sort of information. Companies such as IASbet, SportingBet, Centrebet and SportsBet all include detailed form guides and even the latest racing news. It probably comes as little surprise to hear that the majority of their news comes from the bigger meetings and racetracks such as Canterbury Park, Rosehill Gardens, Moonee Valley and Ascot Racecourse. Tipping apps are generally a bit scarcer in the Australian market but there are some solid ones out there. What’s so solid about the tipping apps is that they often come from well informed companies such as Racing Post and Equibase. 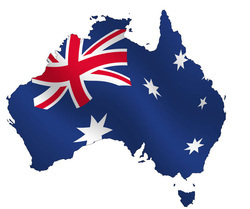 Now we realise that these are targeted more towards that of the UK and US market, but they are so detailed these days, and with the increased exposure of Australian racing to these markets, that they can be used really well for Australian punters as well. In fact, the detail is no less than say any domestic race, but the coverage of races is definitely a factor which suffers for the Aussie public. Live streaming apps have arguably changed the way in which people not only watch horse racing, but also bet on it. A lot of betting apps have streaming integrated into it, where you can watch for free on your mobile providing you have an active or funded account. But Australian bettors actually have more options than most countries when it comes to live streaming. The main apps to look out for are Racing Network Australia and TAB Australia, both of which will charge monthly subscriptions working out around $15 a month or so. But having said that, the coverage you get is pretty sublime for the price. Not only will you get live streams of some of the biggest races in Australia such as The Perth Cup, Magic Millions Yearling Stakes, Launceston Cup and the Stradbroke Carnival but they will also provide detailed tipping for each race, information on the course and a ton of stats and data of which you can apply to your bets to make more informed decisions.